The Sweet 16 is here and prepare yourself more heartbreaks, more shockers, more dominance and more March Madness. Let’s take a preview at the Sweet 16 matchups set to begin tonight. Wichita St vs 3. Notre Dame: This could be the most intriguing matchup out of the of all of the Sweet 16 games. With the Shockers continuing another postseason reaching the Sweet 16 after being their undefeated season was ended by Kentucky, the irony, in last year’s 2nd round. The Shockers have played with the mid-major chip on their shoulder but will face a streaking Notre Dame team that is used to adversity fighting off opponents during their rigorous ACC schedule. This has classic written all over it. Who Wins? Notre Dame moves on to the Elite 8 with the will to win for their coach Mike Brey, who recently lost his mother and has the Fighting Irish playing amongst the top tier of teams in college hoops. North Carolina vs 1.Wisconsin: Injuries can play a huge part in this game, with UNC losing their big man in Kennedy Meeks and Wisconsin gets their senior guard Traevon Jackson back for the first time in nearly 20 games. It will be tough for the Tar Heels to respond with the size of Wooden POY candidate Frank Kaminsky without the size of Meeks, but Roy Williams along with Bo Ryan will have great adjustments as great coaches like the two do. Who Wins? I’ve got Carolina in the upset, as Marcus Paige finds a way to hold a grip over the floor and controls the ball for a UNC win. West Virginia vs 1. Kentucky: With an 8-2 record over his comrade John Calapari, this win would his most appreciated win. To end Kentucky’s streak and advance on would be a dream come true the Mountaineers but it’s going to be a tough feat with Kentucky clicking on all cylinders. The head to head matchup between Juwan Staten and Andrew Harrison should be a great one. Who Wins? Kentucky marches along as they continue to dominate the paint with size of Anthony-Towns and Cauley-Stein, who spark the fast break opportunities in which UK excels in. 6.Xavier vs 2. Arizona: Xavier has not had a great contest yet during the tournament and now have the challenge of the Arizona Wildcats, who are in familiar territory returning their fourth regional semifinal. The Musketeers face their first real challenge and have to learn how to contain the size and athleticism of Arizona. Who Wins? Arizona’s size will be too much for Xavier to contain and will advance to the Elite 8. Michigan St vs 3. Oklahoma: The Sweet Sixteen, when you think of the regional semifinal, Michigan State has been a lock for the past eight seasons. The Spartans under the leadership of Tom Izzo, have been a major part of the big dance every year and now have to face the lone team of the Big 12 remaining, Oklahoma. The Sooners have a lot on their plate with but can pull off the upset if they can stop Travis Trice and Denzel Valentine. Who Wins: MSU wins and put themselves in position to chase for another national championship. NC State vs 4. Louisville: After shocking the Cardinals earlier this season in Louisville, NC State owns the advantage for the regular season. But Rick Pitino and Louisville have the experience to attack during the big dance and could earn their revenge Friday night. Trevor Lacey and company pose a real challenge with as you have seen their progression rise steadily throughout the year. Who Wins ? I’m picking NC State with the upset and I believe that have what it takes and also posses the guard play that can withstand the overwhelming pressure that Louisville plays. UCLA vs 2. Gonzaga: UCLA continues to defy the odds after many believe that they should have not been selected to the tournament. With their collective effort of five players averaging in double figures equals out to the same game that the Zags’ play spread the ball and play efficiently. The teams mirror each other and should make a great West coast matchup. Who Wins? 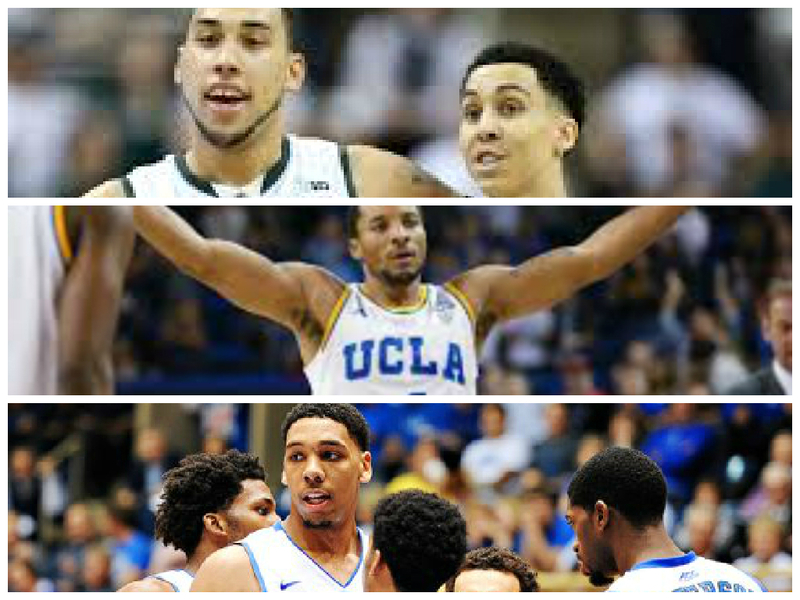 I’ve got UCLA with the upset and the chemistry Steve Alford has built makes them poised for a fight in the tourney. The Battle of the Coach K’s, but one is looking to cement his legacy while the other is looking to make his name known throughout the nation. Duke has looked impressive in their first two games this tournament and made statements doing it, but the Blue Devils often have a program playing with that same intensity night in and night out. Therefore, the Utes could possible sneak their way into a win if Duke allows them to compete. Duke appears to be focused and I expect the same intensity as the freshman trio of Jones, Winslow and Okafor have to make their statements prior to draft time.